Donald Trump's presidency promises much for the U.S. industrial sector, but which of these two stocks should investors prefer? United Technologies Corporation (NYSE:UTX) and Caterpillar Inc. (NYSE:CAT) are both world-renowned U.S. industrial companies with significant exposure to the construction industry. And it's right about there that the comparisons stop. Although President-elect Donald Trump's victory saw both companies' stock price jump on enthusiasm of favorable industrial conditions to come, the key drivers of the stock price of each company are significantly different. Here's a look at what investors need to know before buying either stock. CATERPILLAR HAS HEAVY EXPOSURE TO COMMODITY SPENDING. IMAGE SOURCE: CATERPILLAR. The Trump factor: Good or bad? It's fair to say Trump isn't the biggest fan of the actions of United Technologies' management. During the course of his campaign he repeatedly criticized Carrier, a United Technologies company, for its decision to move production jobs to Mexico from Indiana. Indeed, Trump specifically mentioned an intent to talk to Carrier's management and persuade them to stay in the U.S. in the light of taxes he intends to impose on the company's air conditioning units manufactured in Mexico. 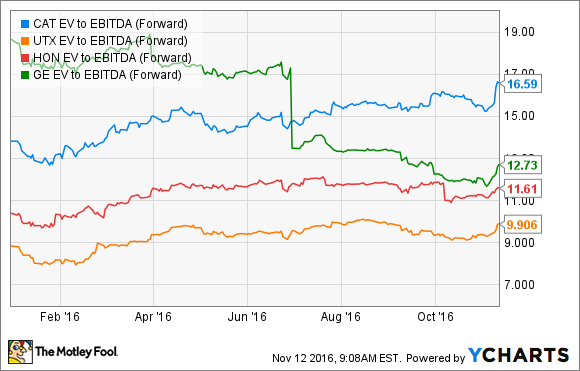 So is Trump's victory a negative for United Technologies? Not so fast. If industrial production and commercial construction picks up in the U.S., then you can be sure that Otis' elevators and Carrier's heating, ventilation, and air conditioning businesses will see benefits. In other words, Carrier's top line would benefit even if its margin were to be negatively affected by Trump's actions. UNITED TECHNOLOGIES NEEDS TO EFFECTIVELY RAMP UP PRODUCTION OF ITS GEARED TURBOFAN ENGINE. IMAGE SOURCE: UNITED TECHNOLOGIES. However, it's hard to make the case that United Technologies would do better than Caterpillar under Donald Trump, at least if you believe that his intentions to revitalize America's coal, construction, and oil and gas industries are efficacious. A look at Caterpillar's end-market exposure demonstrates how reliant the company is on energy and mining, particularly in the United States. If Trump succeeds in revitalizing coal and oil and gas production in the U.S., then Caterpillar will surely benefit. In fact, Caterpillar's exposure to energy is nicely illustrated by the following chart: The stock's performance seems to follow the price of oil rather than the S&P 500 index. In a sense, Caterpillar is an industrial that you can consider as a way to play higher energy prices -- the idea being that energy capital spending will then increase and boost demand for Caterpillar's equipment. In contrast, United Technologies is an industrial stock with minimal energy exposure. The key driver of United Technologies' stock price over the past year or so is summed up in the word "execution." The company is going through a year of transition in three of its four segments. Pricing action is being taken to grow market share with Otis elevators in China, while aerospace systems is trying to establish products on new aircraft platforms -- the products will be lower-margin initially. Both of these actions are reducing near-term earnings potential. However, the most important single long-term earnings driver is the successful ramp-up in production of Pratt & Whitney's geared turbofan engine. It's hardly been smooth sailing, with management forced to reduce its target for production in 2016 from 200 to 150. Bombardier has cited the production setbacks as the reason for delays in deliveries of its C Series aircraft. 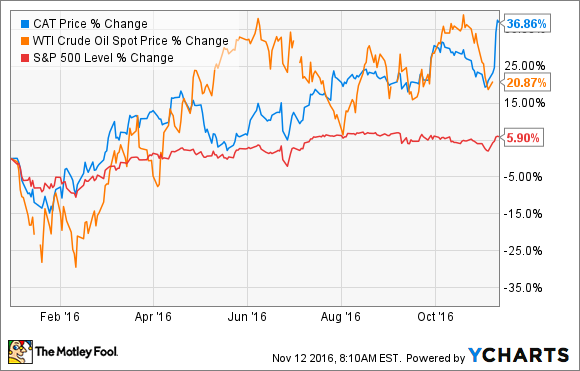 The difficulties have made United Technologies stock one of the cheapest rated within its peer group. CAT EV to EBITDA (Forward) data by YCharts. The decision is based partly on the strength of your views on energy prices. If you're strongly bullish on oil, then Caterpillar would be the pick. However, if forced to choose, I would pick United Technologies. There are plenty of other stocks out there that can give you exposure to the upside from the possibility of rising oil prices. However, United Technologies offers you something different. The valuation is compelling, particularly as this is a transition year in which earnings growth is being constrained because of long-term growth initiatives. Moreover, the upside in the stock comes largely from execution -- particularly with the geared turbofan -- rather than from the economy per se. For this reason, it would give many portfolios some much-needed diversification.